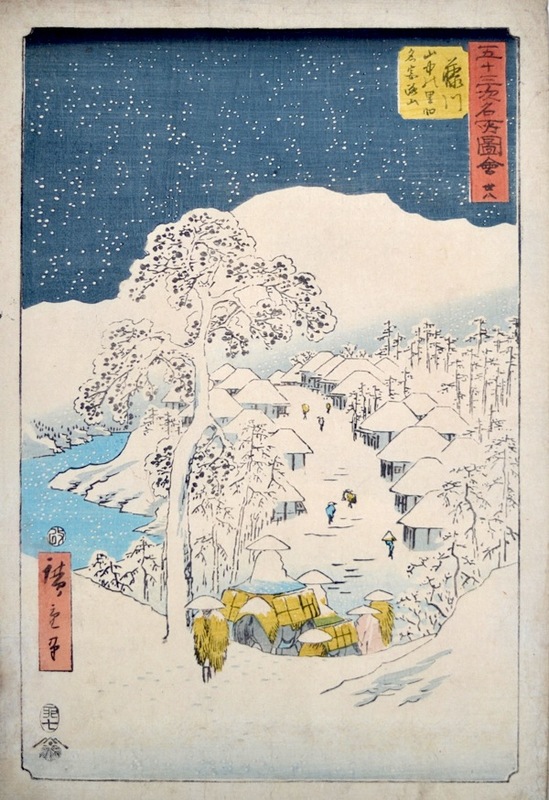 Utagawa Hiroshige (1797-1858) Snow at Yamanaka Village Near Fujikawa from the Upright Tokaido Road Series, 1855. Oban. The Vertical Tokaido series (Tokaido Gojusan Tsugi Meisho zue) was a career crowning achievement for Hiroshige and the finest of his vertical series. This print is considered the masterpiece of the series and is a justifiably famous snow scene in Japanese art. This is one of the five known first edition variations published by Tsutaya in 1855. The scene is of travellers entering the snow covered village down a steep slope; houses stretch out overlooking the river with mountains in the background. Fujikawa is the thirty-eighth station on the Tokaido Road, the main highway that connected Edo (Tokyo) to Kyoto. Yamanaka village was formerly known as Mount Miyaji and the village is today known principally because of the Hiroshige views in his various Tokaido series. The viewpoint in this print is the opposite to that of the original 1832 Hoeido edition. In that print, the viewpoint is from the village looking out of town and up the slope; the distinctive plum tree is visible on the left, (anomalously as in this edition) as is the declivity that indicates the entrance to the village. Hiroshige is as usual an unreliable guide; Fujikawa station had a population of 1,200 people and 300 buildings in the 1830’s and this view is almost certainly from memory, saying more about landscape and drawing than it does about geography. It is however a very fine piece of work indeed. The snow is left in negative, as white paper, the skill here is to compose a scene of heavy snowfall, the mass of the stuff and its relationship to the still falling, dense flakes in the sky without actually drawing it. It is a beautiful and memorable piece of art. Full size with margins, from the first edition with fine colour, fine impression and in excellent condition. Signed Hiroshige ga, with Tsutakichi publisher’s seal, censor’s aratame and date seal of u-shichi, seventh month 1855.